1940s Fashion: How Catherine Zeta-Jones Nailed It! If you think the 1940s is a little too boring for your liking, boy are you in for a surprise! Everyone knows I love period films. Something about these movies that gives me a little comfort that I so seek in every possible way. Well, anyway I watched Dad's Army last weekend, played by one of my favourite present day actresses, Catherine Zeta-Jones alongside a few other big names like Toby Jones, Bill Nighy, and Michael Gambon. 3. And then there was the trench coat. Man, who knew that you could look absolutely smashing in one? And did I mention her hair is just perfect? I loved it styled both ways, pulled back or let loose in those perfect glistening curls. 5. And then, there was this afternoon tea dress in this captivating shade of red. I fell in love with the embroidery detailing the very moment I laid eyes on it. Again, you see how the detailing draws attention to the shoulders, while the cinched waist further accentuates her curves. 6. Last but not least, there has got to be a little black dress right? For sure, ladies. You'll again notice a similar pattern here, where the focus is drawn to the shoulders, arms and waist with the contrasting white on black floral motives. And the hair! Forgive me, but I think you'll agree that Ms. Jones always seems to look like a million dollars. Our mission over the past few weeks was simple. Introduce a range of dresses that were friendlier on the pocket. So, we've been hard at work scouring for budget friendly buys, all retailing at under AU$100. And what did we find? 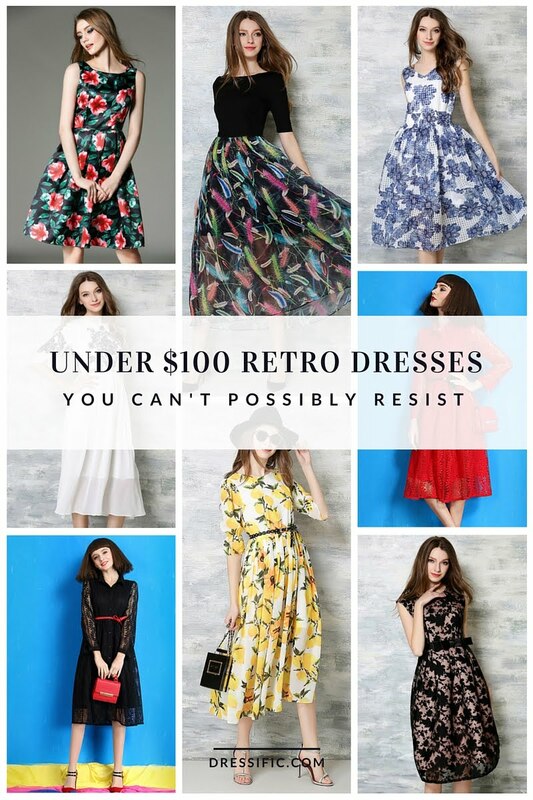 A handful of retro dresses featuring fun, vibrant floral prints and gorgeous chiffon and lace fabrics! These dresses feature round or bateau necklines which are perfect for those who are looking for a more modest design. We've even got a few dresses with longer elbow sleeves and a more generous length (below knee) which are perfect for the cooler winter days! Here's a sneak peek at some of our gorgeous finds, available in sizes S-XL. For more details and photos, head on over to our online store here. Something Wrong With The Fit, Darl? 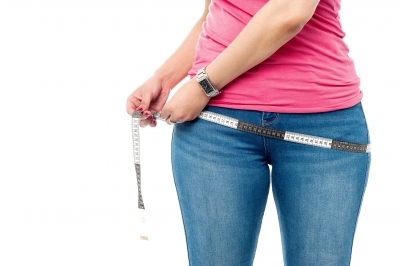 One of the main challenges of shopping online for clothing in general, is the sizing and fit. In fact, in a recent Dressific survey which we conducted a few weeks back, 39% of our respondents listed sizing and fit as one of the biggest challenges when shopping for dresses online. That's nearly 1/2 of the respondents! We will be making changes to our website progressively over the next few weeks so you may notice some differences from what you're used to. Please bear with us as we bring you a newer and improved version of our website based on all your feedback. One of the changes we will be introducing is the Size Conversion Chart. Many of you have requested for this as you'd like to know how our dress sizes correspond to Australian sizing. While we may be able to get this done, I have to say that we can't guarantee that it will be 100% accurate. The thing is, at Dressific, we don't just source our dresses from a single manufacturer. We source from MANY manufacturers. And if you're a seasoned online shopper, you know for a fact how sizing can vary (sometimes by a magnitude!) from one manufacturer to another. 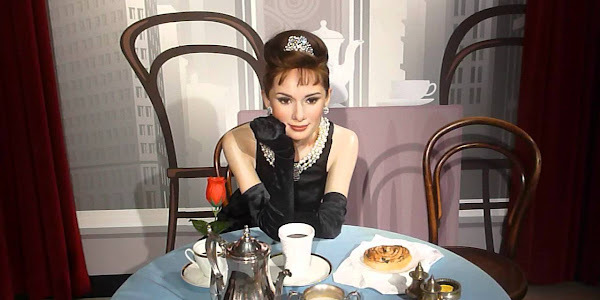 Some dresses are of smaller makes, while others run large. In fact, sometimes the sizing and fit of dresses from the same manufacturer itself may even differ and there could be a myriad of reasons - from the type of fabric used (non-stretchable vs. stretchable) to the dress cuts and patterns. As such, if you've ever shopped with us before or browsed the products on our online store, you'll notice that we never have a standardized size chart. Sure, it'll make life easier for us to plaster a one-chart-for-all to be used throughout our website but it is also HIGHLY inaccurate. That's why we go through the trouble of creating a size chart for each and every dress in our store so that there is a smaller margin of error in terms of sizing. And if you think about it, it's really not that hard. All you need to do is measure yourself once (get your bust, waist and hips measurements ready and write it down on a piece of paper), and each time you shop, just compare your measurements against the size chart to determine the best fit for you. Yes, it does take a little more work but with practice, I assure you it gets easier. And by doing this, you reduce the likelihood of purchasing something that won't fit and consequently, save yourself the time and effort to request and arrange for returns. Finally, if you still find yourself unsure even after going through the size charts, don't hesitate to ask! Hit us up on live chat or shoot us an email. One of our friendly customer service sisters will be more than happy to provide you with sizing advice, tailored to your measurements, height and weight. 25 Gorgeous Retro Print Dresses We Know You'll Love! With over 5 years of experience specializing in print dresses and clothing, our supplier is a much-loved label among our Dressific sisters. 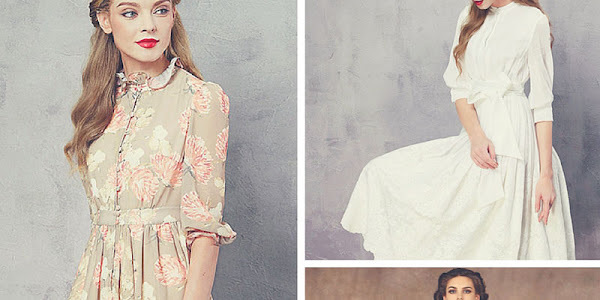 With a focus on the 1940s fashion styles, all their dresses are designed in house, and features more modest tops which are perfect for those who don't want to show too much cleavage. Their dresses are usually designed with fitted waistlines, giving the illusion of a slimmer, more defined waist and knee length A-line skirts, which are universally flattering for almost any body shape. All dresses are made from high quality printed fabrics and feature a wide variety of unique prints that you simply won't find elsewhere. What's more, the fabric used to make their dresses have been specially treated and preshrunk, meaning they have gone through a shrinking process in order to reduce contraction when the dress is washed or laundered. With sizes ranging from S-2XL, these dresses are perfect for both slim and curvy figures. Here are some of our favorites, but do browse our site for even more designs. Enjoy!